I have a habit of buying clearanced appliances.. Most of the time I use them, the ones I don't I give as gifts, a few sit for a few years before I get around to using them. Then there are the appliances that I get from someone else. About 5 years ago my mother-in-law gave me a bread maker. It sat on the shelf for a couple of months and then I used it non-stop for a year. Later it broke and I made bread from scratch for years. Until I found a bread maker marked down to 15 dollars (from 80! ), so of course I had to buy it. Honestly, this summer it has been my best friend. It has kept my house cool when the weather is 95 and humid, which is seems to be frequently this year. 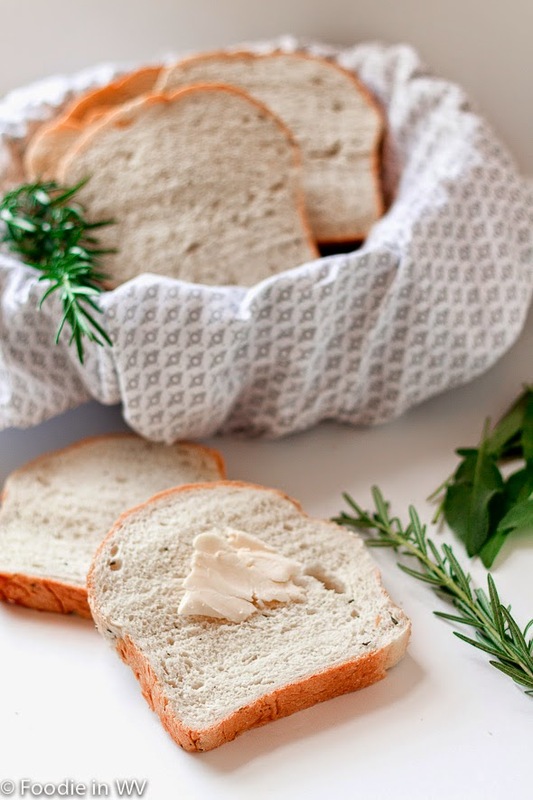 My herb garden has also been crazy so I have been trying to combine my love of making fresh bread with the over abundance of fresh herbs I have in my garden. I discovered a recipe for Rosemary Sage Bread a couple of weeks back and I love it! The recipe is as follows. A savory bread that is a great way to use garden herbs. Works well made in both the bread maker and in the oven. 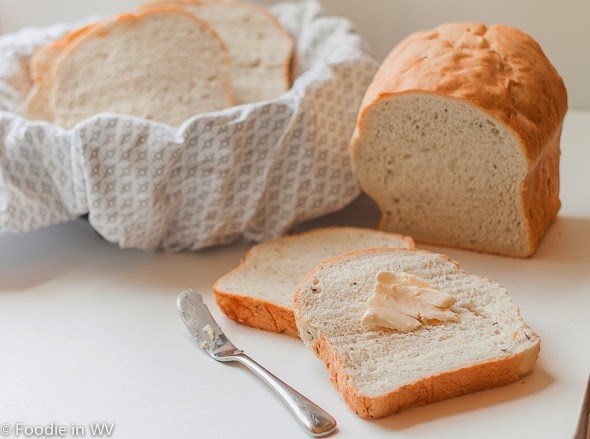 If making in the bread maker add ingredients in order suggested by the manufacturer of your bread maker. If you are making the bread from scratch use the following instructions. In the one cup of warm water dissolve the sugar and then mix in the yeast. After 5 minutes (when the yeast is foamy) add the butter, sage, and rosemary. In a separate bowl combine the bread flour and salt. Add the wet mixture and then knead by hand for 10-12 minutes (alternately you may use a mixer for this step). Rub the inside of a plastic bowl with oil. Place dough in bowl, cover with plastic wrap, and rise for 1 hour or until doubled. Punch down dough, and divide into two balls. Grease the inside of two loaf pans, shape the two pieces of dough into loaves and place in loaf pans. Cover top of pans with plastic wrap and allow loaves to rise for one hour or until doubled in size. While the dough is on the last rise preheat oven to 375 degrees. Bake the loaves in the oven for 20-30 minutes or until golden brown and sound hollow when tapped (total time will depend on your oven, if they brown too quickly tent with foil. A bread thermometer is helpful-when the bread temps 190-200 it is ready to pull out. Allow cool for 30 minutes in pan and an additional 30 minutes before slicing. This bread is nice as a side with soup. It also makes great savory toast, my kids loved it with goat cheese (my kids have adult tastes). You can adjust the amount of herbs based on your tastes. Some people might like more or less rosemary/sage. 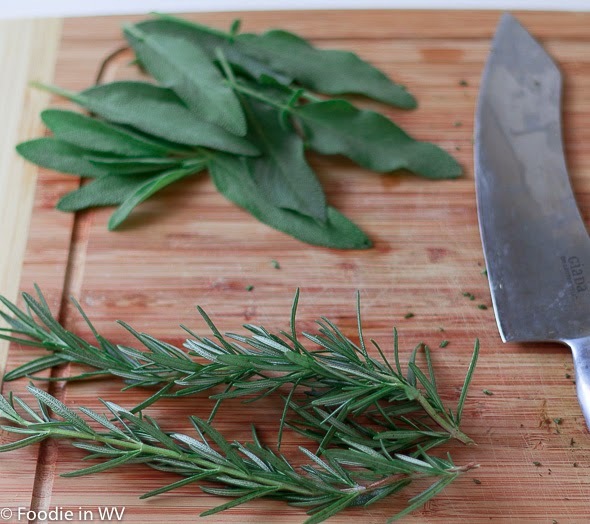 It would also work with other herbs if you have an over abundance of thyme, dill, etc. My mother has a bread maker and has always made her own breads. They are good, but come out in a weird shape. It really depends on your bread maker. The old one I had made really weird shaped bread, but the new one is great and the loaves look like normal. You can always just do the dough cycle in the machine and then do the final rise and baking in the oven. That way you get the great top from the oven that you miss in the bread maker. This year it has really taken off, last year I only planted a few things, so I'm really happy with how well my garden did this year. It did work well as sandwich bread, my kids enjoyed it with sliced deli turkey! It sounds delicious. I love herbs in bread. I used to make one in the bread machine all the time, I should get back to doing that again. I only ever make plain breads lately. A wonderful sandwich loaf, Ann. I am a loyal fan of homemade bread...can't even remember when I last visited a bakery. I'm a fan of homemade bread too. So much cheaper and better tasting than store bought! I always wanted to make my own bread. Just don't have enough room in our tiny apartment kitchen for a bread maker!